Deb's Cup of Tea: And They're Off! There's been a lot of discussion in my news feeds about the value of work and the value of employees. I'm fairly sure I can say that, at one time or another, all of my readers have felt unvalued by your employer. It could have been for an hour, a day, a week or longer, but there are times where you come home, flop down onto the couch and say, "Why am I still giving them these hours of my life when they don't care?" We've been extraordinarily busy lately. It means that I am out in the field, sometimes with 10 minutes notice, simply because there is no one else to cover the work. When that happens, one could be forgiven for trudging home and thinking, "Tell me again why I work here." Morale can plummet when the day consists of yet another fire to fight, another problem to solve and another place to drive to while the desk top is covered with post-its of what you need to get done that isn't getting done. And the phone calls! "Can I please rip the phone out of the wall now?" Having done what I do for 13.5 years now, what I've come to see as valuable to getting through these times is the office event. When we do things together, non work related, your co-workers become people with laundry and mortgages and weird relatives and food likes and dislikes. They aren't just bodies in the next office or down the hall. We do two things a year. We go out to eat some place other than Chipotle at Christmas, with silly gifts sometimes exchanged, and we do something in the summer. We have gone to major and minor league baseball games and a minor league hockey game. We were going to try to get Chicago Cubs tickets this year but early March turned into late May turned into July 7th and we were still not sure what we were going to do. Baseball was kind of out. Mike has two kids under the age of 3. Getting a sitter for a whole afternoon was problematic. Where could we go that the oldest could be contained, yet have room to roam about and not be bored? Ever spent a couple hours with a bored 2 year-old? It is not pretty. 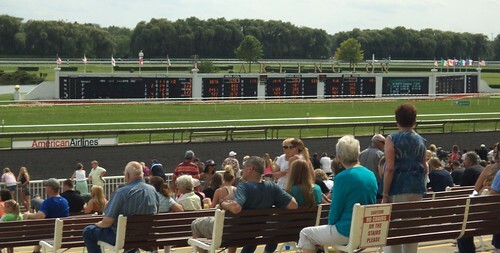 Gene came up with the idea to go to Arlington Park Race Track. I have lived in the Chicagoland Area for over 30 years now. I have driven by this place countless times. I have never gone here. This is horse racing. The above photo is the view of the grandstand from the parking lot. It was free to park and cost $8.00 to get in. The company picked up food and beverages, but Mike decided it would be more fun to get a picnic table in the picnic area. There would be room for his son to run around. He'd be contained and we'd be able to see the races fairly close. Here's the view of the picnic area. While it looks like a mad house, all of these people are clustered around tables. You can bring in coolers (There is a charge.) with food and non-alcoholic beverages. That's a big ol' John Deere farm tractor, the kind I see in Iowa, pulling a discing device to groom the dirt track. There are two tracks here, dirt and grass. The grass one is shorter and is between the dirt where the tractor is and the scoreboards you can see in the background. I was, of course, the first one to arrive from our group. The gal in charge of the picnic area, crossed us off her list, but looked at me rather quizzically. "You're sure your group isn't here already? The tables are all gone." We headed into the picnic area and looked at all the markers. I didn't see anyone from the office there. We came up to a table where a family had a huge food spread across the table. They were not on this gal's list. They claimed they made their reservation online and had 8 pages of confirmation information to "prove" this. Managers and security were summoned and the matriarch of the group started screaming at officials that she would sue because she had proof of her reservation. The table in question was down near the rail by the track. I retreated to the entry gate to let them sort things out and await the rest of the group. Finally, someone from Arlington decided it wasn't worth the commotion. We were compensated the cost of the table and moved to a different location, a better location. We were moved almost opposite the big TV in the infield. The area had a fence. Tables were for rent in this spot but, at $20 each, they weren't going quickly. We had a grand view of the infield TV where we could watch the race. We had a small TV above us that also showed the race. We had a great view of the betting board. There was room for a 2 year-old to run around and not go anywhere. We were under the overhang so, at the end of the day, when it started raining, we were dry. There was no dirt for the 2 year-old to roll in so he stayed reasonably clean. It was pretty nice. 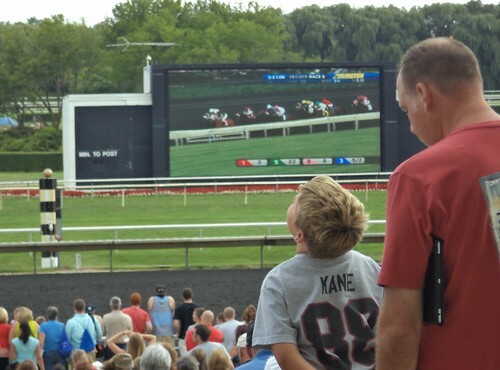 If you've never been to a horse racing facility, this is what it's like. 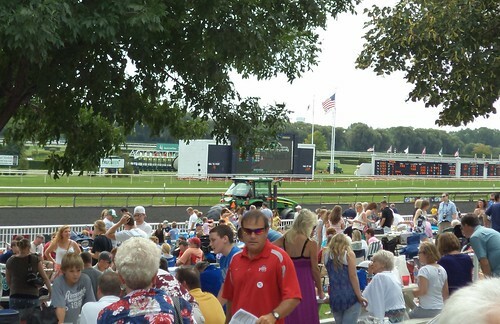 There is a spot where you could preview the horses prior to the race. You could see the jockeys and many of the owners also showed up to stand with their horses. That was a walk down quite a few steps and I was a bit sore so I didn't go there. But the jockeys come out and run the horses up and down the track by the railing so they can wave at people and get a feel for the track. It appeared that some jockeys here have a following as they were waving at groups of people who were calling them by name. Once the horses have made a canter up and down the front part of the track, they are lead into the starting gate. This is from the final race which was on grass, but this machine was also used on the dirt track. Betting stops 1 minute before the race and it was interesting to see people dashing for a machine after finally making a decision as the horses are ridden in front of the stands. There is the familiar bugle call, automated now and not giving by a bugler. I believe that came about 5 minutes before the horses were lined up for the start. Once they are all in the gate, there is a bell and they are off. The design of Arlington is such that you can't see the horses when they are on the opposite side of the track. You're forced to watch the TV screen to see the race. It's very clear who is in front. Red, then green, then yellow and then blue. 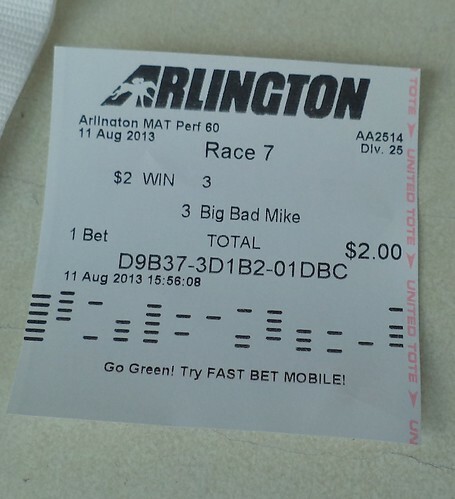 In this particular race, there was a horse named "Big Bad Mike". As that is the boss's name, we all had to bet on him. Because my vacation was upcoming, this was my one and only bet and $2 was the most I felt I could stand to lose. I had the vacation budgeted to a dime. Our location was just a bit ahead of the ending point of the race. Mike was in third in the final turn and was closing in on second. While I bet him to win, others bet him to either place, which is 2nd, or show, which is 3rd. There was palpable excitement. The crowd really doesn't get into the race until they come streaming down this stretch of the track. 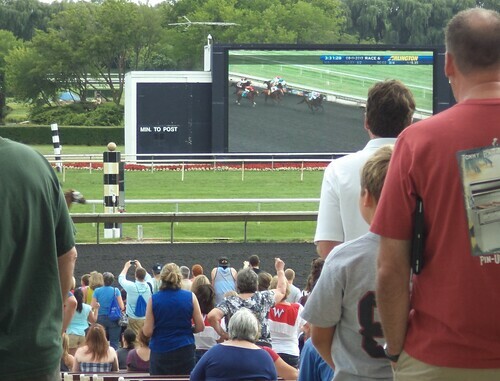 As the horses neared the finish line, people rise to their feet and start yelling. 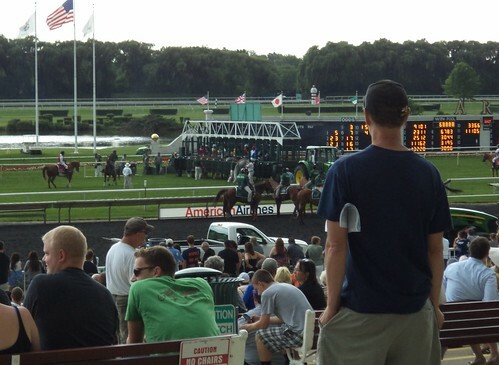 We had a great vantage point to see where the horse we bet on was. It was all over in about 3 minutes. Where did Big Bad Mike finish? Dead last. It was as if he saw the finish line up ahead and said, "Okay, I just have to cross that. I don't have to work anymore." Of course, we all had a hearty laugh about that. Mike and Gene spent a lot of time looking at jockeys, looking at the horses and comparing the odds. For the final race, we had a small surfeit of cash to bet on one or more horses. We decided, instead of checking odds, we'd pick the two horses with the wackiest sounding names and the longest odds at winning. I don't remember, at this time, what we picked, but I think one of them had "chocolate chip" in the name. I've often wondered how people pick the name for their horse. We lost as our horses came in 4th and 5th. Gene was a winner in one of the races we watched, betting on a 22-1 horse to win, which it did. It was a nice time. I wouldn't pay for myself to go back. The race is interesting to watch but it's 5 minutes of excitement followed by 20 minutes of sitting around. No wonder there are beer vendors every 20 feet. There's nothing else to do. People complain of the boredom at a baseball game. I guess it's what I've been brought up with. It's more fascinating, to me, to watch a baseball game than to watch a horse race. Plus, I'm not a gambler. I bet food on football games and that's the extent of things. I don't have $40 to lose. I look at that $40 as a tank of gas and I'd rather put that in my Jeep than give it to a racetrack, but that's me. It kind of reminds me of the opera. Carole likes opera. I can't really stand it. Her senior year in college, she got me to pay for season tickets to Chicago's Lyric Opera. "Mom, you've lived 20 years in Chicago and you've never seen this world renown opera. That has to change." It was fun and I very much enjoyed the time I spent with her at the opera. I'll not pay to go by myself. 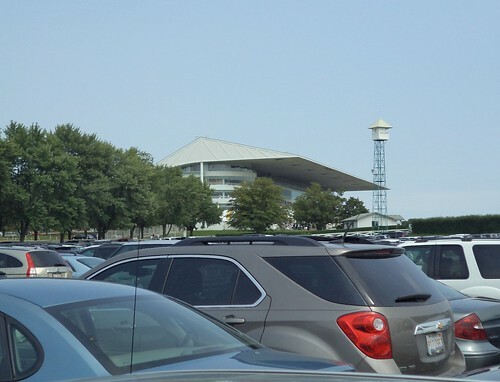 If someone wants to go to Arlington Park and wants me to go along, well, sure, why not, but it's not a place I'm going to spend a lovely Sunday afternoon. The best part of the day was going back to Mike's house and having great food and great conversation while sitting on his back patio. 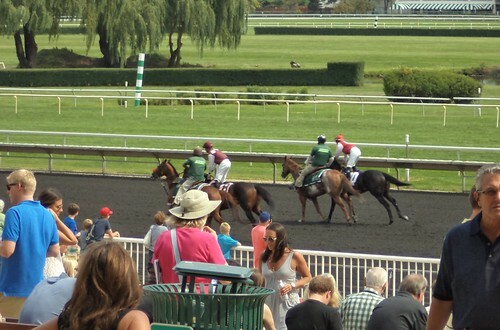 I don't have a "bucket list" but if I did, I can now cross "spend an afternoon at the horse races" off that list.